Fourteen months ago Mark Millar began his "Old Man Logan" arc for Marvel Comics: the story of Wolverine, now some fifty years in the future, eking out a hardscrabble existence with his wife and children in the countryside of an America gone straight to hell. And in all that time Wolverine - now simply known as "Logan" - hasn't once popped his claws. And then the cataract-plagued Hawkeye approached Logan with a business proposition: one that the former X-Man couldn't turn down because he needed the rent money to pay off the inbred progeny of Bruce Banner. For the next several issues we watched Logan and Hawkeye tear across the remnants of the United States en route to New Babylon. And during the trip we finally learned what happened on the night the heroes fell, when Wolverine was brought down so hard that he forever forsook violence. But it was all a setup. Hawkeye was killed by agents of the new President: the Red Skull. Logan wound up meting out a cold dish of revenge in the bowels of the White House, before donning Iron Man's old armor and flying back to California with a valise full of cash: more than enough to pay off the Hulk Gang. 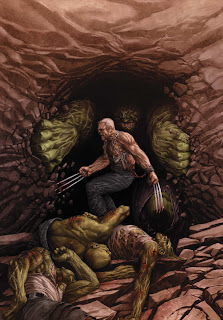 And then Logan arrived home.... to find that his entire family had been killed by the Hulks. They "got bored", Logan's neighbor told him. Do I even need to intimate what happened next, after Wolverine saw the battered bodies of his loved ones? Well friends, it has been a long wait indeed but "Old Man Logan" finally wraps up this week with the publication of Wolverine: Old Man Logan Giant-Size #1. All I will say about this issue is: get it! It's not terribly deep on character or plot compared to what has preceded it... but hey, we do see Wolverine, uncaged after a half-century of self-restraint, totally breaking bad on dozens of Hulks. It's a mean, ultra-violent sixty-four pages that will have you forgetting that the Comics Code Authority ever existed. But I also have to say that it ends better than I had expected (and I had come to expect plenty after how good the rest of this arc has been). By all means buy it now on the stands. Or wait for the "Old Man Logan" trade paperback when it comes out in a few months. I'm not much of a regular comic book reader, but I must attest that "Old Man Logan" has been satisfying enough to warrant some bookshelf space. Absolutely to be recommended! I've had this on my pull list all summer and read it today. Best Wolverine story ever!